Located in the center of the USA, MetroEast Industries has miles of track just south of their offices in Alorton, Illinois and East St Louis, Il. They have hundreds of railcars and locomotives ready for make-overs. These vehicles arrive tired, rusted and in need of mechanical and and aesthetic repair. U-Studios was privileged to provide design for the company’s two-story lobby. The client wanted something that would represent their core business. I first proposed creating a small scale version of a locomotive roaring toward the visitors entering the front doors, complete with a train whistle blowing and signal lights flashing as the door opened. OK maybe a little too much. The visitors could have been scared away. Through discussions with the clients, we settled upon a photomural on each side of the main entrance doors. The west side mural was installed in early 2016 and depicts an aerial view of the rail yard and buildings on property. It is a grand perspective view with the St Louis Arch on the horizon. The black and white photo was shot from a helicopter and then photoshopped to fit the 18 foot width by 24 foot height. We suggested a curved wall that creates a wrap around feeing upon entering the building. The east wall, which is in production depicts the people that make the company successful. Not the clients…but the workers that provide the skills and knowledge like the electricians, mechanics, sand blasters, painters, administrators, and more. The Owners of this company care about their employees and the services that they offer. 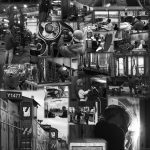 The new mural will be a black and white collage of people at work, displaying the expanse of abilities to take these huge cars and locomotives and make them look and run like new. The mural is 14 foot wide by 24 foot tall. 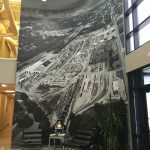 The installation of these two murals add a story and a striking feature to the office building.